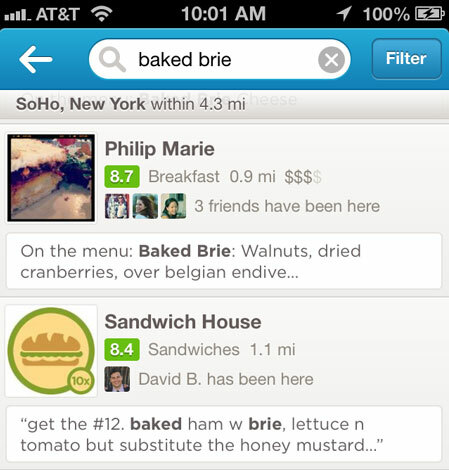 Foursquare announced its searchable menus on Monday — something we talked about as a likelihood way back in January 2012 when Foursquare first added menus to its business listings. Yelp also has a form of menu search, though it’s not as fully refined as what Foursquare now offers and I don’t think Yelp has ever actually announced this feature. In the iOS app (and I presume on Android, too), you can search for specific menu items and Yelp will do its best to find matching places. Sometimes it works pretty well. I did a search for a type of cheese and at least the first couple matches served that cheese in one of its dishes. It’s probably a nice feature for a certain segment of the population, and in competitive restaurant areas, it probably opens the door a bit to a form of MSO … menu search optimization. Anyone doing anything like that with restaurant clients or, if you’re a restauranteur, at your business? Interesting find and question, Matt. 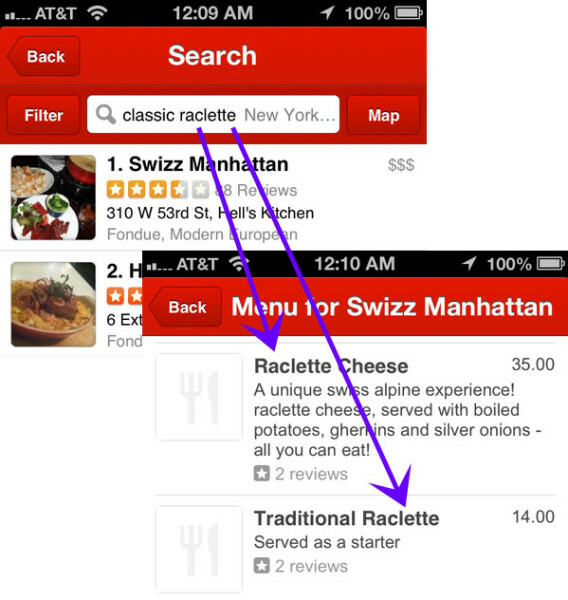 It does look like Yelp’s page for certain foods in Swizz’s menu is marked up with some review schemas, so that no doubt helps. I would venture to say that implementing schemas for menu items on a restaurant’s website would be one of the best ways now to optimize a restaurant’s menu for the sake of SEO. So perhaps the product schema might be used along with the review schema to give it the best shot of appearing with a rich snippet in the SERPs along with of course the schema.org/restaurant markup. I would also say that it’s key to make sure the restaurant’s menu is listed in as many important restaurant-related directories as possible and that the information is consistent throughout. Hey David – that’s a great point. I hadn’t even thought of the Schema option, which would definitely count as MSO. Thx for making the post better with your comment. Much appreciated.